The conflicts of the Emerald Empire’s clans are legendary. Whether it’s on the battlefields of Rokugan or in the Emperor’s Court, tales of the clans’ skills in diplomacy and battle spread across the Empire. 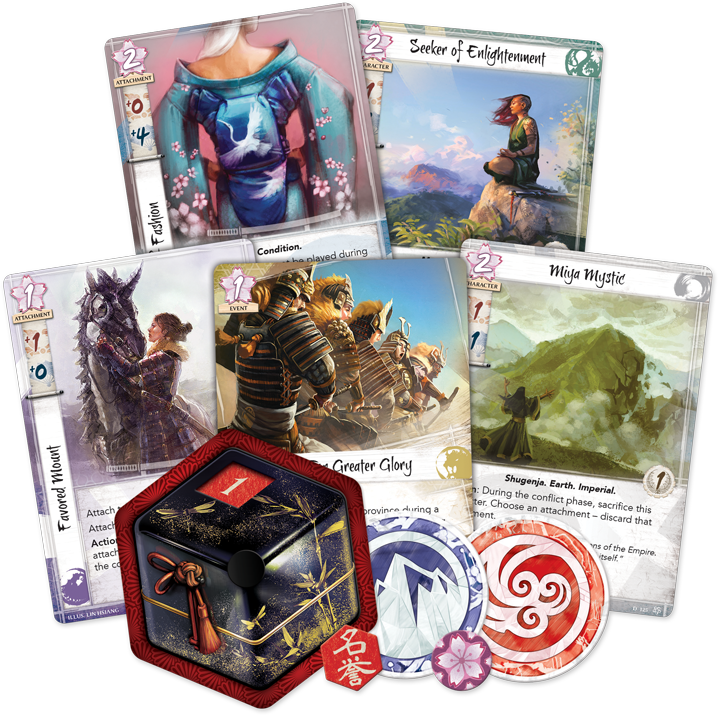 The core of Legend of the Five Rings: The Card Game is bringing these struggles to life. Players will take turns declaring military and political conflicts against each other in order to break their opponent’s provinces and make their way to the enemy stronghold. Players will use all of their clan’s resources to acheive this goal. Everything from conniving courtiers, to mystical shugenja, to honorable samurai to the very champions of the clans themselves. These warriors lead the charge both on the battlefield and in the courts to bring glory to their clan. Use military strength and political ploys to break your opponent’s provinces!